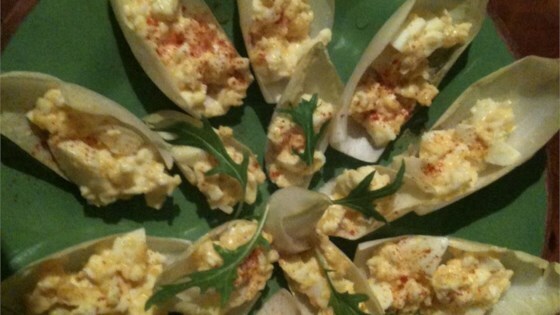 "These egg-salad stuffed endive leaves make a great appetizer instead of salty chips. They look pretty too. If you are taking them to a party, the egg-salad may be made the night before and refrigerated along with washed and dried endive leaves wrapped in paper towels." In a medium bowl, mash eggs with a fork. Mix in the mustard, mayonnaise, salt and dill. Set aside. Select the largest endive leaves, and fill with egg salad. Place on a platter in a fan shape. Sprinkle the olives among the leaves. Cover, and refrigerate until serving. Baked mushrooms are stuffed with seasoned crabmeat. Place eggs in a saucepan and cover with cold water. Bring water to a boil and immediately remove from heat. Cover and let eggs stand in hot water for 10 to 12 minutes. Remove from hot water, cool, and peel. Taste as you salt, it was too salty for me. Great presentation. if you're not a green olive fan try capers but remember they are salty too. This egg salad was delicious - I added a little more dijon mustard to spice it up a bit. Delicious! Solid idea. My husband throw random ingredients at me to see how I handle them and this week it was a baby endive. Made a pretty lunch! We adjusted the egg salad recipe to taste. The egg salad was good, but I didn't care for the bitter flavor of the endive with it. These are delicious! They are easy and they look great.